Wire work is my favorite technique. So I have a lot of wire. I use all kinds including the silver plated variety. They are cost effective especially when wire wrapping as that uses up a lot of wire. Silver plated wire is best for earring dangles and necklaces where the wear is far less than rings. I also like using good silver plated wire besides copper in prototype wire designs. If they work out, the pieces are also saleable! Silver plated jewelry making wire is usually copper based. Note there is a difference between colored copper wire and silver plated colored copper wire. The former is matte in color while the latter has a metallic sheen because of the silver. One brand I have been using for while, well before they even contacted me for this giveaway, is Parawire, made by Paramount, a US wire company founded nearly 100 years ago during the First World War by first generation immigrants. They make all kinds of wire including that used for jewelry making. The wire is available through their website, other jewelry suppliers and at select craft shows. The silver plated silver wire I bought before and received recently for review, is a joy to work with. The core is soft copper. It is also comes coated in a range of colors and has another non tarnish coating on top. Not that unusual you say? What's different with other makes is that silver layer - it is fine silver. Fine silver is almost pure silver (99.9%) while the silver of other makes is of unknown %. The fine silver plating thus imparts a really shiny appearance. Indeed some sterling silver jewelry is deliberately plated with fine silver to get that bright silver color. The above picture shows the difference between 20 G wire I currently have in stock. I've always liked the inexpensive Zebra wire from Fire Mountain Gems. While the colored ones are lovely, the silver colored (not silver plated) copper wire is noticeably grey. The Smart Wire is another inexpensive silver plated wire I got through a Canadian wholesaler (Beazu). I don't think its protective coating (if any) was effective as it was beginning to tarnish even in the package. So you get what you pay for! I now use these inexpensive wire as practice wire for when I teach. So I have been happily using Parawire's silver plated silver wire for the recent tutorials. If you missed these, the links are under the photographs below. As this wire is so soft, work hardening with a nylon hammer is essential. Just one thing. It's not obvious in reality but in photographs, parawire appears slightly yellow tinged when next to other silver metal (ear wires, chain). I am not sure why that is. It could be the light or maybe in combination the white balance of my iPhone camera. But it is a small point, one which you probably wouldn't have noticed had I not mentioned it. In my hands, the pieces look really bright and shiny! If you'd like to win $50 worth of any wire from Parawire, please make a comment below. Make sure you leave contact info below if you do not have an online shop or blog. This giveaway is limited to US and Canada. It ends in a week's time at 6 pm EST Monday, September 7, 2015 . I will pick the winner randomly and announce the results as soon as possible after. So be sure to leave a contact email if you don't have an online link or make sure you come back and check! Otherwise I will redraw in a week. Good luck! I used my iPhone 5, the camera+ app and the Modahaus Tabletop Studio TS400 in natural light for the wire spool and final product pictures. Click here for more information on my How to Photograph Jewelry webinar. Never can have too much wire, I always say! Suzi@suziwollman.com. I'm a follower! Looks like fantastic wire to work with! Would love to try it out! I also love wire wrapping and would love some ParaWire!! I love Parawire!!! 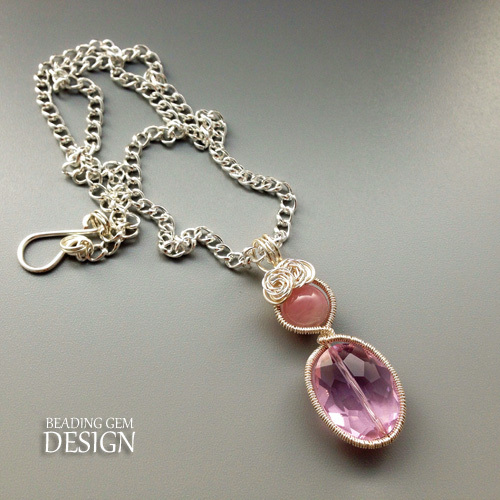 I use it all the time for bead dangles....sooo easy to do a wire wrapped loop. SOOOOO glad that Parawire finally came out with a fine-jewelry option!! The yellowish tinge you see IS the color of sterling silver, which has a small percentage of copper, which gives all silver products made with or coated with sterling silver. The little bit of a yellowish tinge, when compared to whiter or more silvery metals. I am exciting that this product has been released. It will be nice to have a well-recognized brand producing silver-filled wire. Ah, the Parawire silver plated wire I used above has been fine silver plated so there is no copper in it - just 0.1% in impurities. It could be the color of the additional coating they put on top of the fine silver or as I mentioned above, something to do with the photography end. I love Parawire!! I use it to make wire bracelets. It's all I use! Looks like nice wire to work with. I would love to win some to try! I use Parawire in all my wire projects. I like the consistent color and ease of use. This is a majorly SWEET giveaway!!! I would love to have any amount of wire to work with since that is one of my top mediums to work with. Thanks Pearl for the giveaway and to Parawire for having awesome wire. I would never have realized the difference in color had you not placed the 3 wires side by side! Pretty dramatic. I'm convinced! Oh, I love Parawire! I use it a lot whether making jewelry for myself or friends and I find it holds up really well in comparison to sterling in that it doesn't tarnish in occasional wearing and stays looking bright and pretty, when I have to polish my sterling silver wire wraps fairly often. Would love to win! Thanks again for your good advice! While I usually use either copper or sterling silver wire, I would love to try Parawire's silver plated wire as well. That would enable me to get the silver look and sell the items at a lower price as well. Parawire is excellent quality wire so it's got to be good! I am a long time follower and will be sharing this post. Parawire looks so much better than what I've tried so far! Hope I win! I love Parawire! I have been using it for years when I need a splash of color. I love Parawire, and have been using it for a long time. I have found that it is also generally less expensive than Artistic wire, depending on the quantity you buy and the source you use. I am totally addicted to wire wrapping, but I have never tried Parawire. The shiny silver is beautiful! I love this wire! I've only used the smaller gauge for weaving projects, but it's pretty awesome. Love parawire. Thanks for the chance to win, you always have amazing giveaways. I also am a blog subscriber. I am a follower of your blog and have been for quite a few years. I would love to try wire so bright and shiny, knowing it is "silver" coated! This would be so great. Love their wire. I had not heard of this wire until you did this blog. Thank you. I will look for it on the west coast and visit the website. Thank you for this opportunity. Wire is useful for just about any type of jewelry! I'd certainly love to win. Great giveaway! Have always wanted to try Parawire! I use Parawire in the Artisan Copper and Brass, and am really pleased with it's workability and the finished look. I usually stay away from silver plated wire because I don't like the look of most of it, and I worry about cleaning the plating off with the tarnish, so this sounds like something I should try. I am a blog subscriber. Love to wire wrap with Para wire. Thanks for the opportunity. mcd1264@gmail.com. Cool giveaway.Who doesn't doesn't love parawire? I am a subscriber, a follower and posted the giveaway on my Pinterest page on the giveaways page. Thank you for having a giveaway! The wire and pieces are beautiful! I love wire, I have used it for viking knit!! Love the wire! Love your giveaways! Thank you! I love, love, love Parawire. I even bought some of their round stainless steel wire to try wire weaving with. It should be interesting. Haven't used Parawire as of yet...would love to. No question I will order it in the future. I'm a follower. Thanks for the info on wires. I will take more notice and defiantly try the Parawire. I love working with Parawire. It is so easy to wire crochet. I saw a new technique today that uses Parawire and I'm dying to try it. I follow on bloglovin, pinned, tweeted, FB post, emailEd to friends and shared on G+. Thanks Pearl! I love wire wrapping and have tried lots of different types, but never Parawire. It's not readily available where I live. I'd love to with this giveaway. Thanks for the chance to win. I enjoy working with Parawire very much. I would love to win a $50 gift certificate! I would like to try parawire and this would be a great opportunity to do so. We're big fans of Parawire - we use it all the time! Best selection of gauges and colors for all our work. I totally agree - Parawire makes the nicest wire around. I especially like the non-tarnishing part. I get really tired of polishing and polishing wire isn't easy to begin with - especially after you've wrapped it around something. I also like that you can buy it in different spool sizes - large - for the wire you use the most - and the smaller size for occasional use. Great company - great product - great service!! I haven't tried this wire but have just ordered a couple of spools. Willing to try most wires especially since what I have available in the retail market around here is either way Over-priced or just plain cheap wire no artist would even think of using on a piece of work they want to last over a few days!!! SO I will try this Parawire and I am sure it will meet my needs!!! I would love to win some wires. I am taking some beginner classes on craftsy. I have only used copper and silver wire. Would love to try Parawire. Parawire is by far the most malleable of the craft wires, and the plating is beautiful. Because of the coating, wire slides easily against other wires when doing patterns like Viking knit. And, because it is fine silver, it looks great when paired with jewelry made with argentium or fine silver. Parawire is my favorite. I learned of it taking a class by Mary Hettsmanberger!! The Parawire looks so much better than the others! 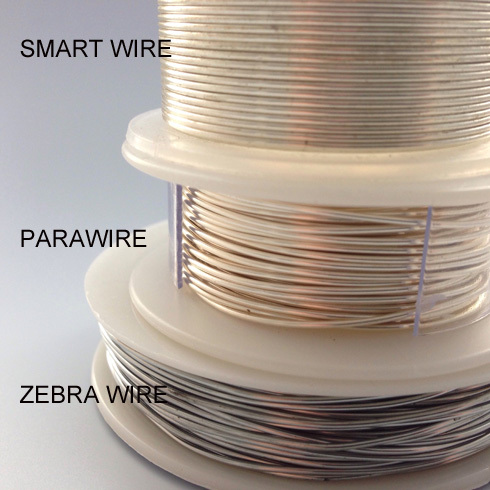 I have only used Zebra wire before, as it is the easiest to get locally, but am looking forward to finding some Parawire. Thanks for the useful info on wire! Would love to win some. I love working with wire, and I would love to try out this wire;) I collect and use many kinds of wire it is wonderful medium to play with. I appreciate the chance o win too! I love your site, and your great tutorials! I love Parawire! I hope to get back to wireworking this winter (we've been redoing our new home!) and would LOVE some new wire to go with the MILES of copper wiring I'm repurposing from our renovations. I use Parawire all the time! Love Parawire. The silver is great but they have other fab colors as well. Thanks for the informative post! I love parawire! It's the best wire out there and never loses its color as some other wires do. I would love a chance to restock on some of the wire I'm running low on. Thanks for the chance with this giveaway! Awesome giveaway! Would love to get some more wire! I love working with wire and this one looks like a great one to try! If I'm not using Sterling Silver wire, I'm using Parawire. It's great in all aspects. Thanks Pearl! Thank you so much for the information on the different wires. For someone new to wire wrapping, it is valuable info. I found out the hard way that trying to save a few dollars on wire now costs more in the long run. Although as you mentioned, I now have plenty of practice wire to use while learning new techniques. I also want to thank you for the opportunity to stock up on Parawire with this giveaway. I never use Parawire but seems to be easier than other wire to work with. I love doing wire jewelry but sometimes my hands didn't like it (arthritis pain)! Thank to give me a chance to win. I'm a suscriber. Have a nice day. Interesting article and always glad to hear of new to me products! Fantastic contest. I use many different types of wire but have not tried ParaWire. Nice that it is made in USA and I would love to win. Also love the larger spools. This would be new and exciting for me. Yes, please! Thank you, Pearl, for this information. Your photo makes it so clear that it will be easy to remember....even for me! You can never have too much wire. I would love to try this one. 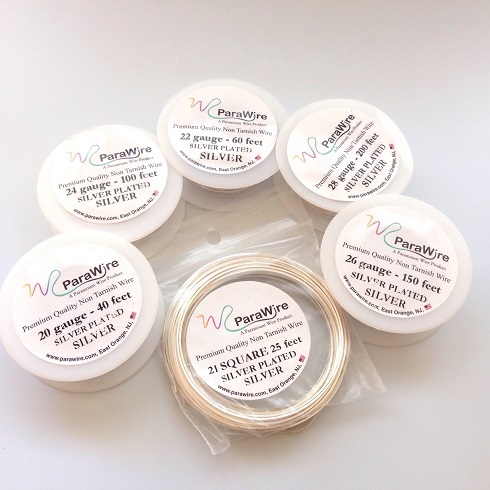 I love Parawire's craft wires for my crocheted wire jewelry. They have so many beautiful colors. I am new to jewelry making. I haven't tried parawire as of yet. It sounds like a good product. Thanks a lot for all the information about wire! I learned a lot from your post. And Parawire sounds great! I love trying new wire, but haven't seen Parawire before. I would be excited to WIN some and be able to try it for free!! I do a lot of "prototype" pieces. I love using Parawire's products. I have some necklaces and pendants that I made for myself some 4-5 years ago that still look amazingly bright and shiny! Just clean them as you would any other jewelry and keep them stored correctly and they will last and last! What a great giveaway as well! Parawire makes quality products. I've been impressed with all of my purchases from them. More wire is always handy. This is a good giveaway! I have been working with wire for a short time and would love to try Parawire. Thanks for the opportunity to win! I ran out of time to visit them at beadfest, and every person I spoke with about wireworking pointed me in their direction. I would love to win this giveaway! Please email me at apridedesigns@gmail.com if I am, chosen. Thanks! I have used the thinner gauges but would love to try the heavier weights. The silver is beautiful. Have never used Parawire myself but would be willing to use it. I prefer using Parawire - what a great opportunity to stock up!! I would love to win this so I could try some of my designs in a silver wire. Love, Love, Love Parawire...I will never use anything else. I love Parawire! You can do so many things with it. I love parawire! I do many different crafts with different guages. Currently I'm working on something that requires 30G. I love Parawire but haven't tried their silver yet. I love using Parawire's non tarnish silver wire and have been using it for years. I knit wire bracelets and the parawire wire holds up better than any others I've worked with. I usually work with the 26 and 28 guage. How does this wire compare with Artistic Wire? I use that brand with zebra wire and am curious what you have found. I have recently started to try Viking Weave, or Viking Knit, and having wire that stands up to the weaving and eventual wear is so important! Your designs are lovely (and similar to my own taste!) - thanks for the chance to win! Parawire is my wire of choice for designing and teaching. I have used Parawire for the last few years as a wire jewelry artist. I love the Silver Plated because with all of the twist in my work and the non tarnish enamel finish, it is easier for my customers to maintain than even sterling silver. I have also used it for wire wrapped rings with surprising success under normal wearing conditions. I discovered Parawire a few years ago at the Tucson Gem and Mineral show. I don't use anything else since then! It's wonderful! I would love to win this giveaway! Great review and I enjoyed the tutorials, too! I have used a wide variety of parawire sizes and colors. They stimulate my creativity. I am able to created unique jewelry to match my outfits without ruining my budget. It handles great to use with or without stones. I love the freeform styles it inspires me to make. Nice! I'd love to try this out- just checked their site, and their pricing's really reasonable. :) I follow via RSS, on My Yahoo. Thanks for sharing- this looks like my new favorite vendor! I've been using parawire for years and I especially love the silver plated heavy gauges! I love Parasite it gives me such lovely results! I have been using tarnish free wire from Parawire for almost 10 years. My customers are amazed that it is not fine silver and love the enameling that keeps it looking like new for years and years. Whenever I do a craft or artisan show I always wear a piece that I made 6 years ago to have that example to show customers how beautiful the shine is after that much time. I only buy from Parawire and have enjoyed the results and the reasonable price of the wire. It makes my jewelry pieces more than affordable. I wish I didn't have to sleep because then I could create gorgeous art pieces from jewelry to housewares using my favorite PARAWIRE!! love the array of colors -- just stunning! I love Parawire so have to try this new wire. Wonder how i would look wrapped in it? I have ordered Parawire several times and the products are great. they are what you ordered. they have not tarnished even on finished pieces that I kept for myself over two years ago. I long Parawire. Parawire has the best selection that I have ever seen. The wire colors are fun and classic. I absolutely love all the wire, which makes it difficult to choose when ordering...I normally use silver, gold, or gun metal. I would love to win $50 of parawire! They're a great company and are more than willing to work with you on any issues you may have. I am a loyal Parawire customer. Their silver wire (16 ga. and 14 ga.) is the brightest and most consistent of all suppliers I've tried. I won't be looking elsewhere for my wire needs. I'm new to wire wrapping and greatly appreciated the information you give about the qualities of various wires. Love your website. I'll put my name and contact info here, since I don't see any other spot for it (recovering techniphobe). Sarge Furman (quilting website: www.sargedesigns.com or email: psargef@aol.com. Thanks for the chance to win great supplies! Pearl, I am not familiar with this brand, so I am most happy to read your glowing review on it. I too have bought inferior silver plated wire, and happen to have several spools of Fire Mountain's Zebra Wire and Wrap It wire in my wire stash. As you said, the silver looks a dull grey color, so I too use it for practice or when I want a sort-of, gunmetal look. Their gold color wire is also off color. Well guess we live and learn. I will definitely start looking for suppliers that carry the Parawire brand. Thanks again for an enlightening post and a fabulous giveaway. Drat it all . . . not sure if this will be a duplication or not. When I clicked Publish, my login to Google Blogger had expired so I had to login and then return here. Naturally when I got back my comment was no longer visible, leaving me to wonder "Did it go through?" or "Was it deleted when I had to leave the webpage?" Your designs are so very lovely. Parawire is my wire choice for all my jewelry - love its sheen and the variety of colors. I just started using parawire in my wire wrapped jewelry after using another brand of wire for a few years. What an difference there is in parawire!! It is shinier and the coating stays on the during the wrapping process. I love it and would love to win more wire!!! Would love to start using Parawire... I love making twisted wire jewelry. This is something I Look Forward To trying. I appreciate the explanation of the differences in wires. I really like working with Parawire, especially for colored wire rings. As my granddaughter says, a girl can never have too much bling. I'd enjoy having more to work with. Love, Love, Love this wire!! I am a jewelry designer and I have tried other products but none hold up like Parawire. Every piece of jewelry I make and sell has to be perfect so I want it right the first time every time! Love the color choices too! I've been using Parawire for over 2 years. I crochet with wire and beads - not professionally, but for myself and gifts for friends and family. I have NEVER had a piece of wire break from too much movement while crocheting and its not rough to my hands. I love all the different colors and they are easy to "fuse" together to create multi-colored jewelry. Thank you for making such a great product. I have used Parawire for about 9 years now, I love it! Love this stuff. The best to work with. Good to teach with and the quality is really amazing. The silver is better than sterling. Is this similar to German Wire? You mean German Style Wire? It is also a silver plated wire. The brand also has non tarnished brass wire. But as I mentioned before, I like Parawire silver plated silver wire because of the fine silver they use. Extra bright and shiny. I love this stuff! Tried another brand (only so I would get free shipping on my order with them) I don't like it like I like Parawire. Three likes! I made a lot of Barbie doll jewelry with the silver & the gold. I'm leaving a shout out at my Barbie Collector group... so enter me twice, I need more Parawire! I love working with Parawire. I have used bare copper and several of the colors, especially Antique Bronze!, but never the silver-plated. After seeing this great review I may have to start including it in my work. Best wire I have ever used. I would love to win this set of Parawire! I love Parawire and have used this for several years. I live on a boat and other wires have tarnished while Parawire does not.I work with both colored and the golds/silvers. When I weave, this is the wire to use, it is cost effective and looks beautiful. I love Parawire, especially the non tarnish silver as it always stays bright and shiny like it had just been polished. I love ParaWire, it always makes my creations look so much better, my wire stash is getting very low! Don't use any other wire. Love the result of my projects using Parawire. Wears well and always looks awesome. I use Parawire for most of my creations! Best I've found! I use only Parawire when not using sterling silver wire. I use the silver plated non-tarnish wire for my crocheted necklaces with pearls. There is no safe way to clean tarnished sterling wire when pearls are involved. I also enjoy using the colored parawire in 18 and 16 gauge for making wire earrings. Fun! I LOVE Parawire. Their colors are fabulous and the quality is noticeably better than the rest out there. I only ever use Parawire. It is hands down the best wire out there! Thanks for posting the comparison photo. I've been using the zebra wire for 18 and 16 gauge along with another brand you didn't mention, but the color differences make it difficult to use the two brands together. Looks like the parawire might be a better choice for me. I have used several different types of wire round, half-round square and twisted plus several gauges from Para W. Loved the great service as well as fast shipping. These products have never let me down. I LOVE Parawire! It's easy to work with, and the bright shine that never tarnishes is a BIG plus! I'm a Parawire "snob" I tried other wire but have always come back I love how easy it is to work with, it's consistency from one spool to the next, how it holds up over time, how easy it is to clean, honestly I NEVER use anything else. Oh! and the colors just get better and better. I LOVE PARAWIRE and use nothing else. AND they now make jump rings, Whats not to love about Parawire? Love Parawire, especially the shaped wires. It gives the designs more depth. I really enjoy using Parawire. The silver is my favorite but all the colors are fun! 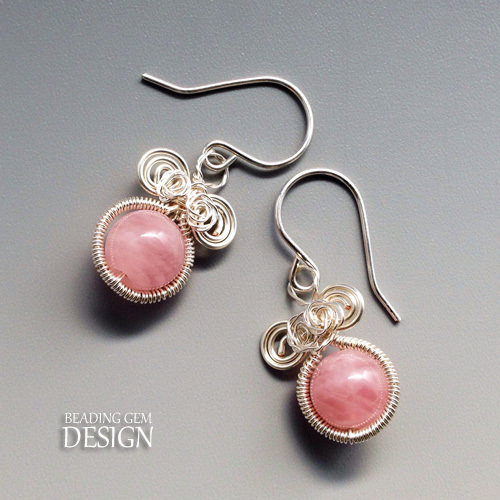 Your tutorials are great, I definitely want to try the wire wrapped DIA Beads earrings. Looking for a better wire to replace my current brand. Getting ready to order Parawire and it feels great to read all these comments! I have traditionally used silver and gold. When granddaughter got into steampunk, went with gunmetal and black. Then I took a class, and we did a pendant, ring and bracelet with Amber Parawire. Really a stand-out color both with colored beads and contrasting metals! As with a lot of things, I tend to be conservative because I can't buy it all even if I want to, but loved the Amber enough to keep it in my resources for making wire jewelry. Always need to try something new! I use parawire, and more parawire would be great. Love Parawire its beautiful to work with. I love Parawire, it's a nice inexpensive wire and that it's made in the USA is a selling point for me. Parawire is the wire I use the most and always will. Parawire makes great wire for wire wrapping - I've been using it since started making jewelry. would Love to win this prize. I use Parawire for a variety of jewelry making from bails to crocheting necklaces. I especially like the fact it won't tarnish and its hypoallergenic coating. I have never heard of parawire until this post.....it sounds absolutely heavenly!!!!! I would love a chance to be entered in this contest to give it a try!!! !